There is a growing consensus, in Canada and around the world, that fiscal policy has an important role to play in delivering stronger economic growth today, and in expanding the economy’s growth potential over the long term. The Government will deliver on its promise to help strengthen and grow Canada’s middle class to recognize this potential. In December 2015, the Government began the important work of strengthening the middle class, by introducing significant tax cuts. Budget 2016 makes further targeted investments to grow the economy and create opportunities for the middle class. …A comprehensive approach is needed to reduce over-reliance on monetary policy. In particular, near-term fiscal policy should be more supportive where appropriate and provided there is fiscal space, especially through investment that boosts both the demand and the supply potential of the economy. In challenging economic times, Canadians and the Canadian economy need help. The Government is committed to providing that help in a fiscally responsible way. In particular, the Government is committed to reducing the federal debt-to-GDP (gross domestic product) ratio to a lower level over a five-year period, ending in 2020–21. Where new spending is introduced, it will be focused on boosting Canada’s long-term growth potential while preserving our low-debt advantage. This section outlines the major global and economic developments over the past year and lays out the Government’s fiscal plan, including measures in this budget. Notes: This section incorporates data available up to and including March 17, 2016, unless otherwise indicated. All rates are reported at annual rates unless otherwise noted. The global economic situation remains challenging. Global growth continues to slow, financial market volatility has risen, equity values have declined and commodity prices have fallen significantly. Global economic growth slowed in 2015 to its weakest pace since the 2008–2009 recession, led by slower growth in emerging economies. In China, real GDP growth in 2015 eased to 6.9 per cent, its slowest rate of growth in 25 years, reflecting weaker growth in the country’s industrial sector (manufacturing and construction). This slowdown reflects the transition of the Chinese economy toward slower but more sustainable growth based on household consumption and the service sector, rather than on investment and manufacturing. The International Monetary Fund (IMF) expects that growth in China will continue to decelerate modestly over the near term, but there are risks that growth could slow more sharply than expected (Chart 11). Years of strong investment and a large increase in corporate sector debt pose the largest risks. 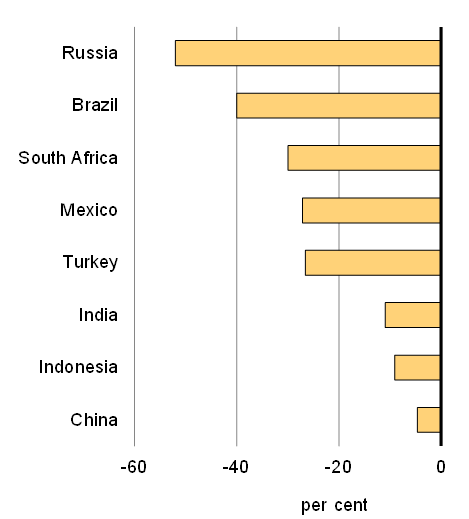 Growth in other emerging economies also slowed in 2015, particularly commodity-producing countries. However, growth in these other emerging economies is expected to pick up modestly over the near term as the outlook for commodity-producing countries stabilizes. 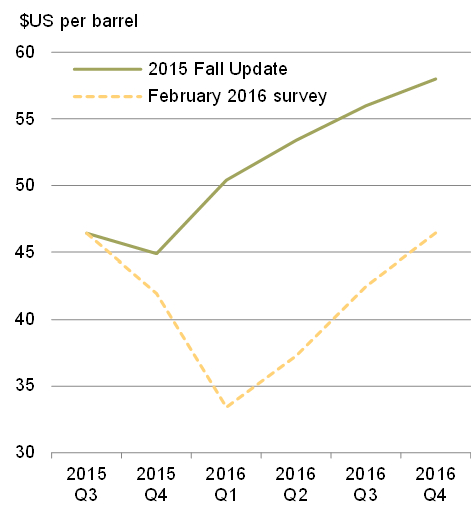 Sources: Haver Analytics; IMF, January 2016 WEO Update. Sources: IMF, October 2015 WEO and January 2016 WEO Update. : Department of Finance calculations. 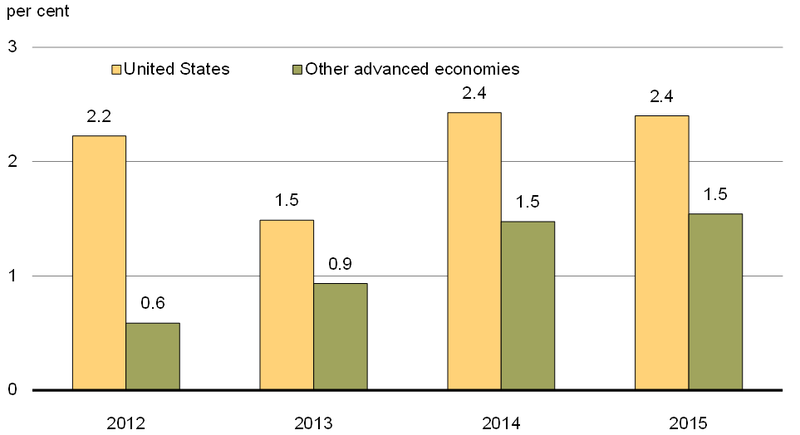 Growth in most advanced economies remains modest. In the euro area, real GDP growth improved to 1.5 per cent in 2015 from 0.9 per cent in 2014, as lower crude oil prices helped to boost consumer spending growth to its fastest pace since 2007. Progress towards a more robust recovery remains tentative, however, as high levels of non-performing loans have restricted lending to businesses, hampering the investment needed to sustain stronger growth. 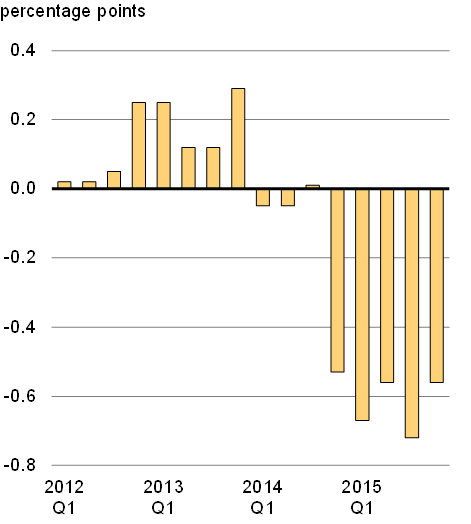 The IMF expects euro area growth to remain slow over 2016 and 2017. Significant risks to growth persist, including high levels of sovereign debt, still-weak bank balance sheets, geopolitical uncertainty with regard to Russia, and the ongoing refugee and migrant crisis. In contrast, the United States has been a relatively bright spot in the global economy (Chart 12). Real GDP growth in the U.S. held steady at 2.4 per cent in 2015—above its recovery average of 2.1 per cent—thanks to strong consumer spending. The U.S. labour market also continues to show strength—net new job growth has averaged 235,000 per month over the past six months and the unemployment rate has fallen to 4.9 per cent. The improvement in the U.S. economic situation has been accompanied by moves from the Federal Reserve to normalize monetary policy, first by ending asset purchases and, more recently, by raising its policy interest rate for the first time since the 2008–2009 recession. Fiscal policy was broadly neutral in 2014 and 2015 following significant tightening earlier in the recovery, but is now expected to be modestly supportive of growth in 2016, primarily reflecting increased spending, including a new five-year program on transportation infrastructure. Sources: U.S. Bureau of Economic Analysis; IMF, October 2015 WEO and January 2016 WEO Update; Department of Finance calculations. That said, the U.S. is not immune to the effects of a challenging global economic environment. The roughly 20 per cent appreciation of the U.S. dollar since mid-2014, combined with restrained global demand, has hurt U.S. net exports. 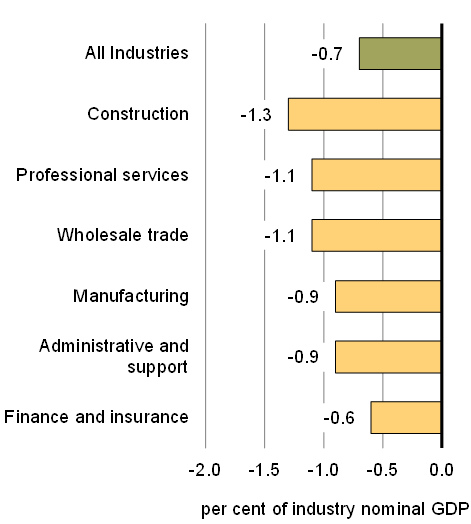 The manufacturing sector has been particularly hard hit (Chart 13). 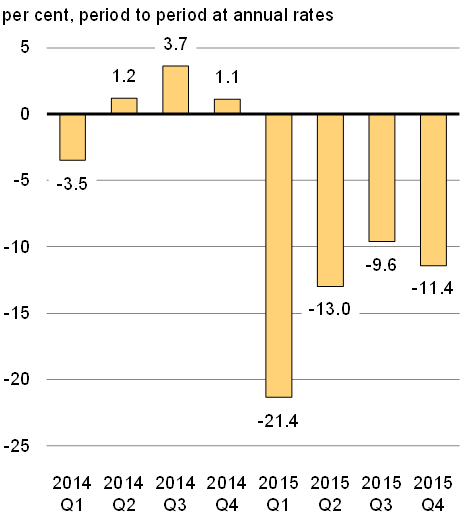 During 2015, the decline in net exports subtracted 0.6 percentage points from U.S. real GDP growth. In addition, amid the decline in global oil prices, oil and gas investment is down by half, weighing on broader economic activity and employment in the energy-producing regions of Texas, North Dakota and Alaska. Note: Last data point is February 2016. Sources: U.S. Federal Reserve; U.S. Institute of Supply Management. Note: Last data point is 2015Q4. Sources: U.S. Bureau of Economic Analysis; Department of Finance calculations. At the same time, lower gasoline prices appear to have boosted household saving and balance sheets rather than spending. As a result, the overall impact of lower oil prices on U.S. growth has so far been broadly neutral. According to the survey of private sector economists conducted by the Department of Finance in February 2016, real GDP growth in the U.S. is projected to remain steady over the next few years. Growth is expected to be in the range of 2-2.5 per cent through 2020, due to a solid labour market, sound corporate and household balance sheets, and a continued gradual recovery in the housing market. 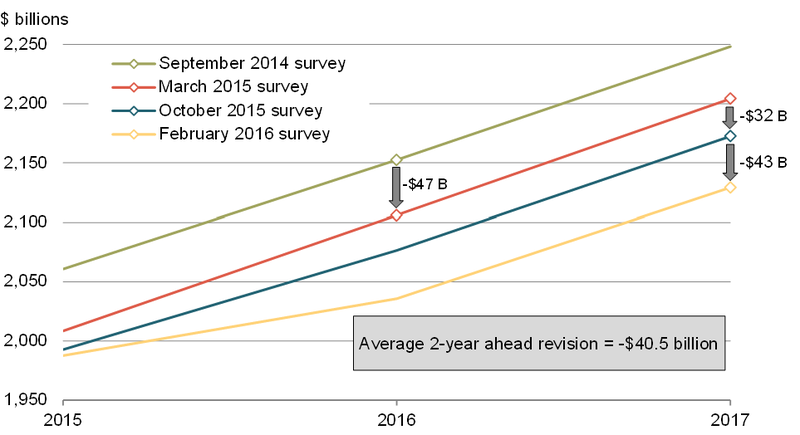 That said, the average private sector forecast has been marked down from previous surveys. This primarily reflects the negative impact of the stronger U.S. dollar on exports and the related external forces of weaker-than-expected global economic activity. In this context, owing to a fragile global environment, the risks to the American economy are tilted to the downside. In particular, the U.S. could be negatively affected by further financial turbulence emanating from China and other emerging economies. While the effects of global headwinds have so far been confined to manufacturing and resource industries, this weakness could spread to the broader economy. Indeed, survey data on non-manufacturing activity has shown a softening in recent months, indicating that momentum may have already slowed. Overall, the IMF has revised down its outlook for the global economy and expects growth will continue to be modest in 2016 and 2017, well below the pace at the beginning of the decade. Important risks remain to global growth, including the possibility of a hard landing in China and continued weaker-than-expected growth in the U.S. and other advanced economies. As global growth has continued to slow, financial market volatility has risen. Concerns over China’s slowing growth, and uncertainty about how Chinese authorities will respond, have led to turbulence in Chinese equity markets, which has spilled over to equity markets in advanced economies (Chart 14). Financial market volatility also seems to reflect concerns about how rapidly the Federal Reserve will raise its policy interest rate, and worries about the negative impacts lower commodity prices may have on emerging economies. These factors have led to a tightening of external financing conditions for many emerging economies—capital inflows have declined, sovereign spreads have widened and currencies have depreciated further. This has increased the risks to growth in emerging economies, particularly those with high levels of corporate debt (often denominated in U.S. dollars) or large current account deficits. Financial conditions have also tightened in some advanced economies, notably the United States. Notes: For Canada, the S&P/TSX; for the U.S., the S&P500; the emerging economy composite is a GDP-weighted average of the Brazil Bovespa, Russia RTS, India Bombay Sensex and China Dow Jones China 88. Daily data up to and including March 16, 2016. Notes: Currencies are expressed in U.S. dollars per unit of foreign currency. Weekly data, change between July 4, 2014 and March 11, 2016. Persistent oversupply and rising inventories, along with generalized financial market turmoil and weak demand, have continued to weigh on commodity prices. This is particularly true for crude oil prices. West Texas Intermediate (WTI) oil prices declined to close to their lowest level in over a decade in early 2016 before firming somewhat in March. Most analysts expect oil prices to remain low and volatile, but given rising global demand and easing supply, expect market conditions to balance and prices to begin to recover later this year or in early 2017. 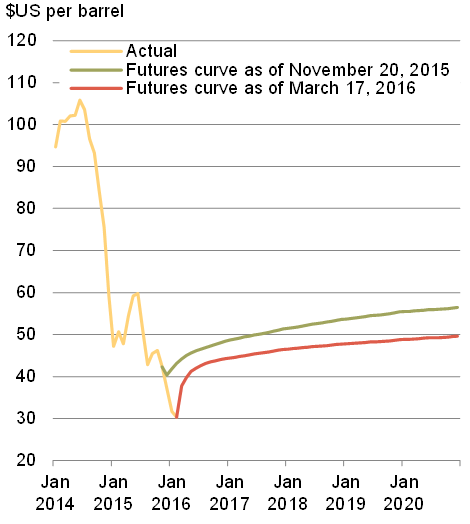 Current futures prices suggest that oil prices could remain low for an extended period (Chart 15). Note: Last data point is March 16, 2016. Sources: Commodity Research Bureau; Bloomberg; Department of Finance calculations. Note: Last data point is December 2020. The fragile and uncertain global economic environment has weighed on Canada’s own economy. Over the last four years, growth in Canada has slowed to below 2 per cent on average and the sharp decline in global crude oil prices since the end of 2014 has placed more significant downward pressure on the economy. However, the conditions are in place for the economy to begin to regain momentum, and post more solid GDP growth and job creation going forward. These challenging external economic conditions—in particular the large and rapid decline in global crude oil prices—had a significant impact on the Canadian economy in 2015, and will continue to cast a shadow over the country’s prospects in 2016. The magnitude of the shock facing the Canadian economy is substantial. 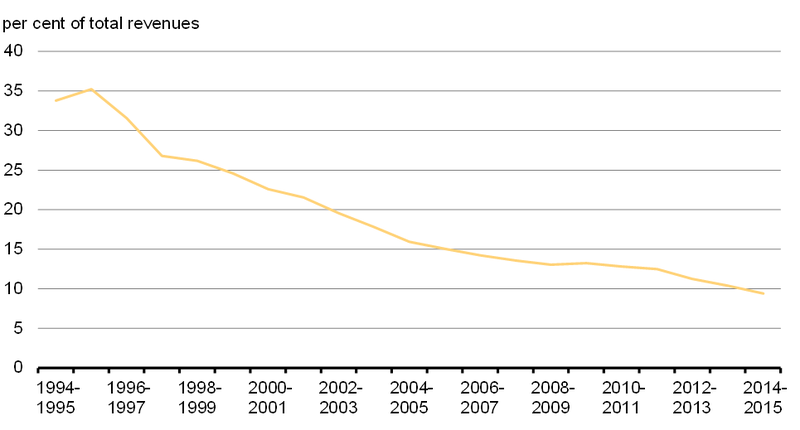 Commodity prices began to decline in mid-2014. Oil prices have now dropped by about 65 per cent and are expected to recover only slowly in the coming years. 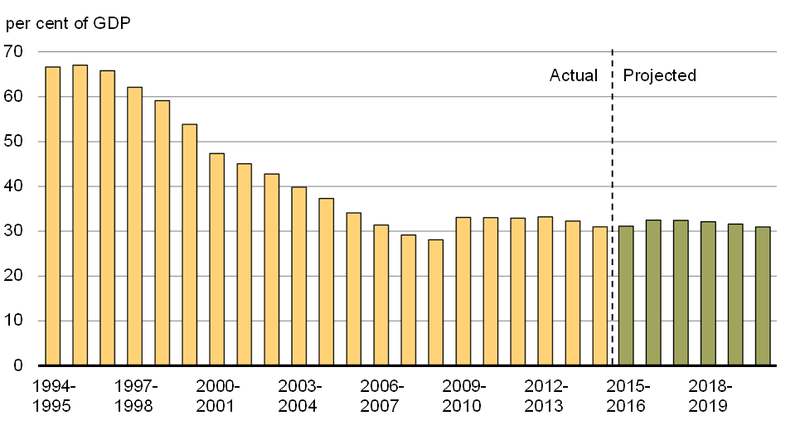 Compared to what was expected at the time of the Department of Finance June 2014 survey of private sector economists, conducted before the collapse in commodity prices, the level of nominal GDP for planning purposes is more than $150 billion lower, equivalent to about 7 per cent of GDP, by the end of 2017 (Chart 16). Canada has suffered a substantial income shock relative to what was expected in mid-2014, and compared to the U.S.
Notes: Dashed lines are forecasts. Last data point is 2017Q4. Sources: Statistics Canada; U.S. Bureau of Economic Analysis; Department of Finance’s February 2016 survey of private sector economists adjusted for planning purposes. Notes: Dashed lines are forecasts. June 2014 survey figures have been restated due to historical revisions to the Canadian System of National Accounts from Statistics Canada. Last data point is 2017Q4. Sources: Statistics Canada; Department of Finance June 2014 and February 2016 surveys of private sector economists; Department of Finance. 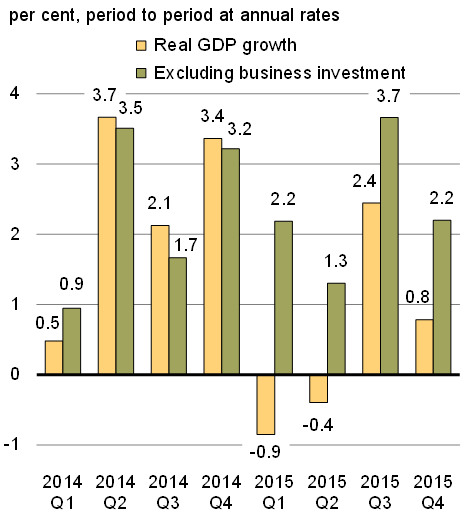 Because low crude oil prices led to significant declines in investments in the oil and gas sector, real GDP growth was negative or weak over much of 2015 (Chart 17). Estimates from Statistics Canada and the Canadian Association of Petroleum Producers suggest that oil and gas investment dropped by between 30 and 40 per cent in 2015—a negative shock to the economy of $30 billion or more, equivalent to 1½ per cent of nominal GDP. Sources: Statistics Canada; Department of Finance calculations. The declines in business investment in the oil and gas sector have been felt most dramatically in related sectors and in the major oil-producing provinces of Alberta, Saskatchewan, and Newfoundland and Labrador, where the impacts of the sharp decline in oil prices continue to unfold. In Alberta, paid employment1 has fallen by about 65,000 since October 2014 (when oil prices began to fall notably), with over 95 per cent of these positions lost in industries directly related to the oil sector. Many indicators of broader economic activity, such as retail trade and housing sales, have also weakened, and there is a risk that both will fall further in the coming quarters as employment in the province continues to decline. The spillover effects of weakness in Alberta’s economy—traditionally a strong contributor to Canada’s economic growth—are already having direct negative impacts on the broader Canadian economy. 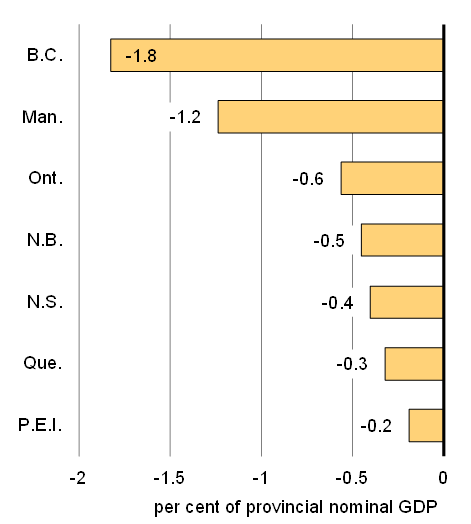 Lower investment in the oil and gas sector is reducing demand for goods and services across Canada. 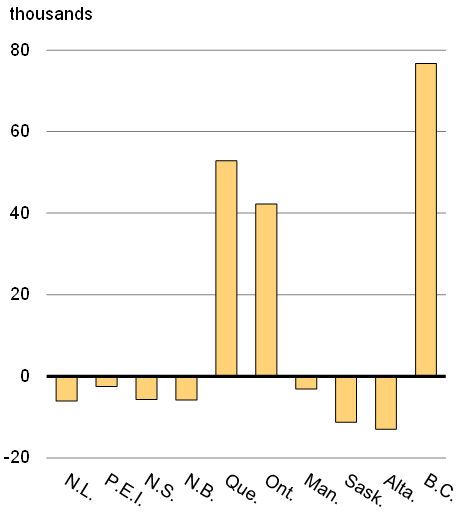 Simulations conducted using Statistics Canada’s Input-Output model suggest that a 50 per cent decline in oil and gas sector investment (in line with current industry expectations for the cumulative decline over 2015 and 2016) could reduce output outside of major oil-producing provinces by almost ¾ of a per cent (Chart 18). This finding is supported by the Bank of Canada’s Winter 2015–16 Business Outlook Survey, released in mid-January. The Survey noted that over the course of 2015, an increasing number of firms located outside energy-producing regions and active in non-energy sectors have begun to report negative impacts from the oil price shock. 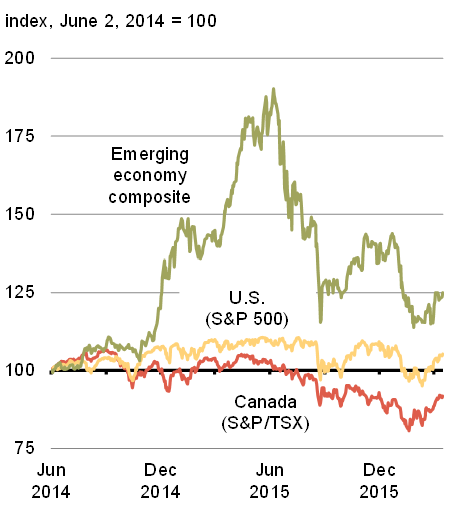 Though current circumstances are challenging, the Canadian economy shows signs of resilience. 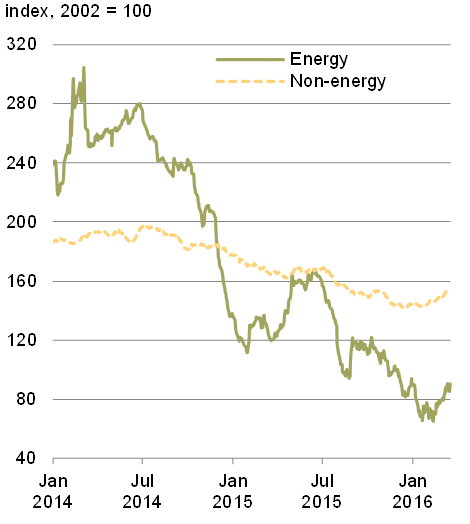 Energy-related output contracted sharply over the first half of 2015, but output outside the energy sector remained largely stable. Moreover, over the second half of the year, despite significant ongoing weakness in the energy sector, non-energy sector output regained momentum, rising at an annual average rate of 2.2 per cent. This spurred average growth in total industry GDP of 2.0 per cent over the second half of the year (Chart 19). 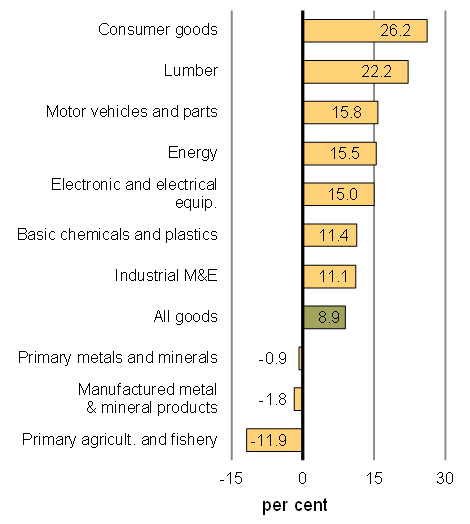 Notes: Real GDP at basic prices (2007 constant prices) by industry. Energy-related goods-producing industries include oil and gas extraction, support activities for mining and oil and gas extraction, and engineering and other construction activities. Last data point is December 2015. In addition, despite job losses in oil-producing regions, total employment in Canada has risen by almost 125,000 since October 2014, reflecting gains outside the resource sector (Chart 20). This growth was not strong enough to offset labour force population growth, however. As a result, the national unemployment rate increased to 7.3 per cent in February 2016, up 0.7 percentage points from its level in October 2014. 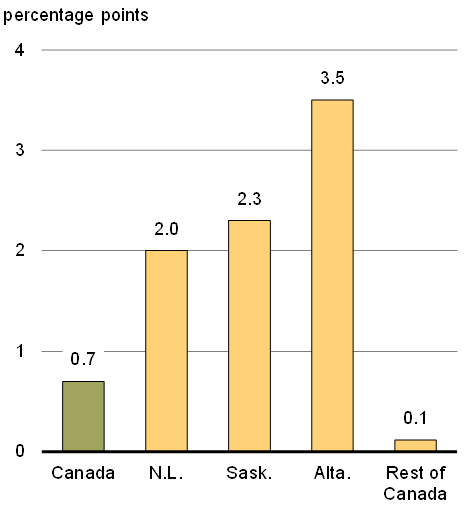 Note: Employment as measured in Statistics Canada’s Labour Force Survey. Last data point is February 2016. Looking ahead, the Canadian economy is well-positioned to begin recovering from the global oil price shock, gain traction, and post more solid GDP growth and job creation. As the economy gradually adjusts to weaker commodity prices, a lower Canadian dollar and ongoing growth in the U.S. economy are offering some support. 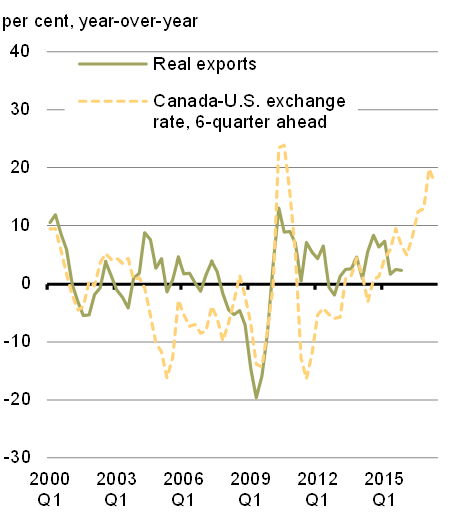 Canadian exports have shown signs of improvement, particularly forestry products, motor vehicles and consumer goods, in line with increased demand for vehicles and strengthening housing market activity in the U.S. (Chart 21). 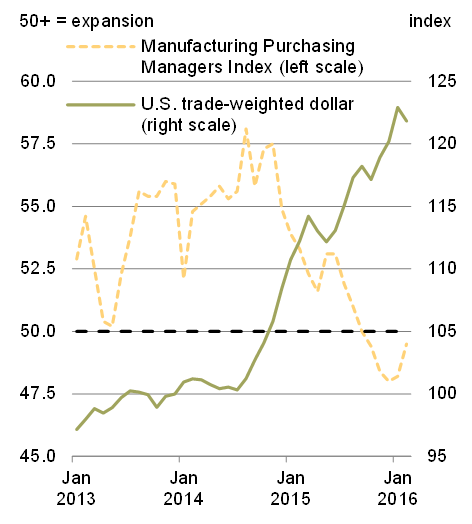 Stronger exports at the end of 2015 and in early 2016 are also translating into solid gains in real manufacturing sales. Note: Last data point is 2015Q4 for real exports and 2017Q2 for the 6-quarter ahead exchange rate. The potential for stronger exports, along with the expectation of steady U.S. growth, will also boost incentives for Canadian firms to invest in additional productive capacity. Over the last six years, manufacturers have operated near capacity, but investment has performed quite poorly. As of 2014, manufacturing sector investment had fallen by 16 per cent from its pre-recession level. To meet increased demand, Canadian producers will have to increase investment, boosting near-term economic growth and longer-term productive capacity (Chart 22). Boosting investment will be somewhat more challenging due to the lower Canadian dollar, given that imports account for a significant portion of machinery and equipment purchases. However, this is likely to be outweighed by the positive impacts of stronger external demand on profits and therefore incentives to invest. 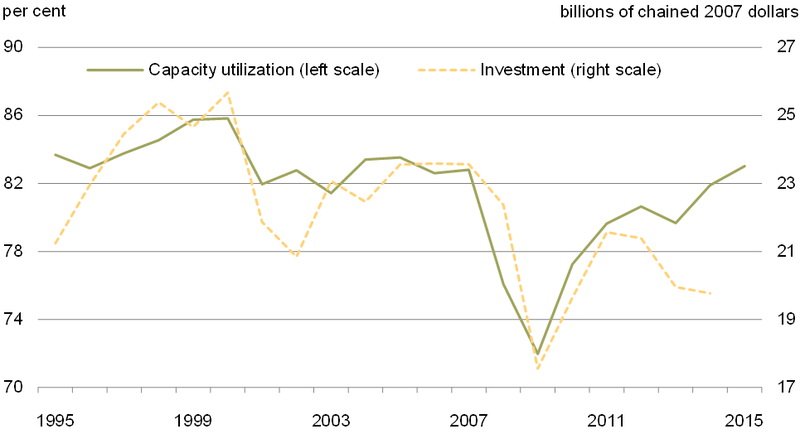 Note: Last data point is 2014 for investment and 2015 for capacity utilization. Beyond restoring Canada’s exports of existing goods to our traditional markets, if Canadian exporters are to succeed over the long term it will be essential that they exploit rapidly growing emerging markets and shifts in technology toward cleaner and more connected economies. 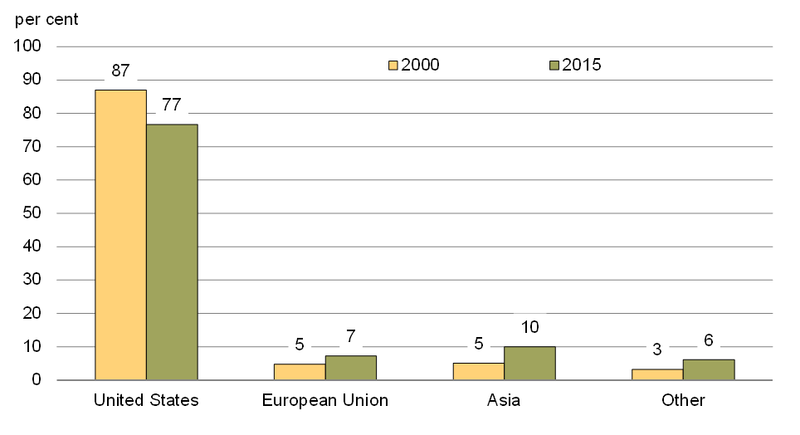 In particular, by the end of this decade Asia is expected to represent almost half of the world’s economy. While Canadian exporters have made some inroads into these markets, there is potential for a stronger contribution to growth from exports to these markets going forward (Chart 23). Note: Asia excludes the Middle East. Totals may not add due to rounding. In light of recent developments in the global and Canadian economies, private sector economists have revised down their near-term outlook for real GDP growth and GDP inflation (Chart 24). Private sector economists now expect real GDP growth of 1.4 per cent in 2016 and 2.2 per cent in 2017. These economists are also forecasting an average price of US$40 per barrel for WTI crude oil in 2016. These lower expected crude oil prices have led to revised expectations for GDP inflation (the broadest measure of economy-wide price inflation). Economists expect GDP inflation of 1.0 per cent in 2016. Nominal GDP growth in the February survey is expected to be 2.4 per cent in 2016. 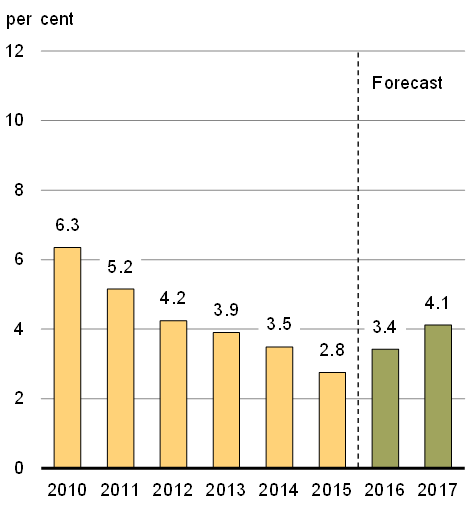 Further details on the average private sector forecast can be found in Annex 1, Table A1.1. 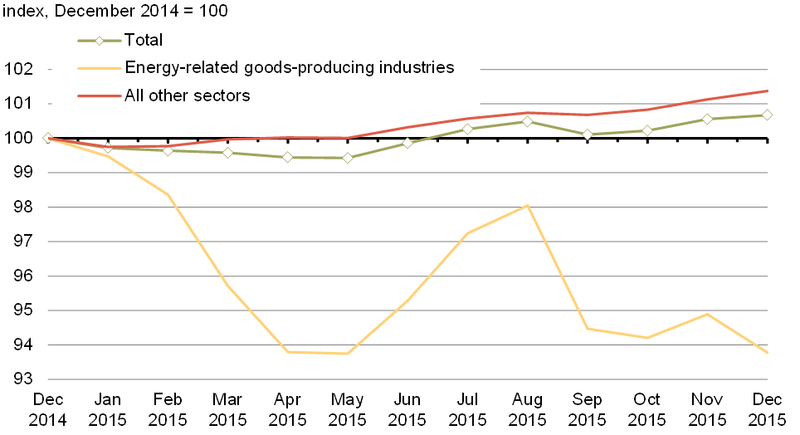 1 Actual data available at the time of the February 2016 survey, that is, the Canadian Economic Accounts for the third quarter of 2015, released on December 1, 2015. Sources: Statistics Canada; for the November 2015 Update of Economic and Fiscal Projections (2015 Fall Update), Department of Finance October 2015 survey of private sector economists; Department of Finance February 2016 survey of private sector economists. Sources: Commodity Research Bureau; for the 2015 Fall Update, Department of Finance October 2015 survey of private sector economists; Department of Finance February 2016 survey of private sector economists. The Canadian economy continues to face the risks outlined in the Department of Finance’s February 22 outlook. Growth in the U.S. economy could fail to meet expectations. This could have negative implications for Canada’s exports and could also limit the incentives for increased investment in non-energy sectors of Canada’s economy. Crude oil prices could fail to rebound as quickly as expected. Indeed, futures markets suggest crude oil prices in 2020 could remain about US$14 per barrel below expectations in the February private sector survey. Further sharp exchange rate movements and large capital outflows could lead to financial strains in vulnerable emerging economies. This could spill over to global financial markets, with impacts on Canada. Rebalancing in China could result in a sharper-than-expected slowdown in growth, prompting further volatility in financial markets and greater declines in global commodity prices. Beyond these risks to the global economy, there are also downside risks specific to Canada. There is a risk that the positive effects of a lower dollar on Canada’s manufacturers and exporters could take longer than expected to materialize and be less beneficial than anticipated—and that the adjustment process may prove costlier and more challenging than expected. Canada’s manufacturing industry underwent significant structural changes over the last decade, as a result of a much stronger dollar. In order to take advantage of the new lower exchange rate environment, manufacturers will once again need to undergo a period of adjustment. Further, many of our competitor countries in the U.S. market (such as Mexico) have also seen declines in the value of their currencies relative to the U.S. dollar, which could reduce the boost to Canada’s international competitiveness resulting from the lower dollar. Canada’s household debt-to-disposable income ratio remains high, which could limit the contribution to growth of both housing and consumer spending to a greater extent than is anticipated in coming years. Given these risks, for fiscal planning purposes, the Government has judged it appropriate to adjust downwards the private sector forecast for nominal GDP by $40 billion per year for 2016 through 2020. Firstly, this adjustment is consistent with oil prices averaging about $25 per barrel in 2016, rather than the $40 assumed in the February survey, and real GDP growth of 1.0 per cent in 2016, rather than the 1.4 per cent in the February survey. Real GDP growth of 1 per cent is within the range of private sector outlooks in the February survey, while oil prices declined to close to $25 per barrel in both January and February. Secondly, this downward adjustment is broadly equivalent to the average downward revisions to the private sector forecast for nominal GDP in Budget 2015, the November 2015 Fall Update and the February 2016 survey (Chart 25). Note: Figures have been restated due to historical revisions to the Canadian System of National Accounts up to the third quarter of 2015, released on December 1, 2015. Sources: Department of Finance September 2014, March 2015, October 2015 and February 2016 surveys of private sector economists. This forecast adjustment translates into a fiscal impact of approximately $6 billion per year in 2016–17 and over each of the next four years. The Government will continue to evaluate economic developments and risks to determine the appropriateness of this forecast adjustment in the future. The G20 must plan now for coordinated demand support using available fiscal space to boost public investment. Governments in many countries are currently able to borrow for long periods at very low interest rates, which in effect increases fiscal space. Many countries have room for fiscal expansion to strengthen demand. This should focus on policies with strong short-run benefits and that also contribute to long-term growth. In an environment of sustained economic weakness and historically low interest rates, fiscal policy is the right policy lever to use to support long-term growth. Indeed, international organizations, including the IMF and the OECD, have called on countries to make use of available fiscal room. The Government believes strongly that the best way to deliver more prosperity to more Canadians is by investing in the economy today. From Canada’s position of fiscal strength, with a low debt burden (Chart 26), with public debt charges as a percentage of budgetary revenues at near-historic lows (Chart 27), and with interest rates at historic lows, now is the time to make those investments. Notes: The total government net debt-to-GDP ratio is the ratio of total liabilities, net of financial assets of the central, state and local levels of government, as well as those in social security funds, to GDP. For Canada, total government includes the federal, provincial/territorial and local government sectors, as well as the Canada Pension Plan and the Quebec Pension Plan. 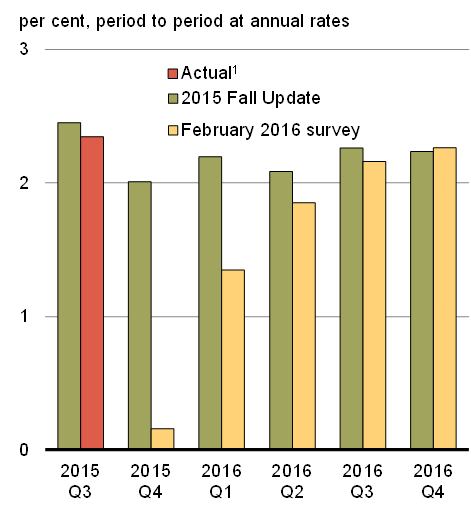 Source: IMF, October 2015 Fiscal Monitor. With this budget, the Government is seizing the opportunity to make targeted investments totaling $50.2 billion over six years (Table 1, “Budget 2016 measures”). 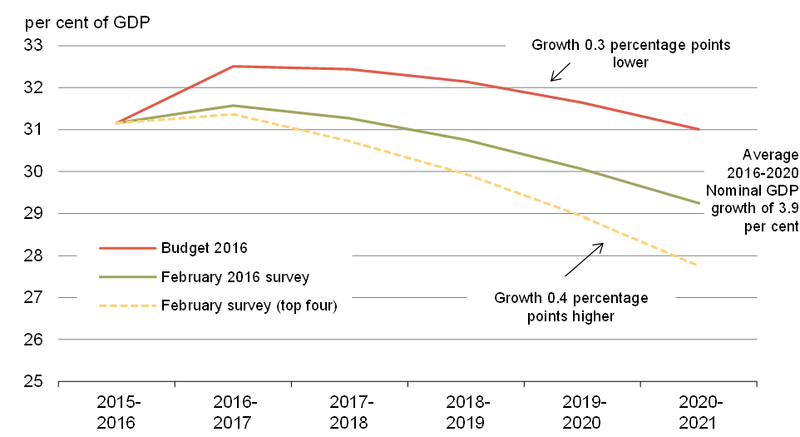 Using the February outlook1 for planning purposes, and accounting for budget measures, the budgetary balance is expected to show a deficit of $29.4 billion in 2016–17, gradually declining to a deficit of $14.3 billion in 2020–21. Further details are provided in Annex 1. 1 The fiscal outlook released on February 22, 2016 is based on the average private sector economic forecasts in the February 2016 survey, the adjustment of $40 billion per year to the private sector projection for nominal GDP, and fiscal developments since the Fall Update. 2 Includes the impact of budget measures on public debt charges. The Department of Finance estimates that the measures contained in Budget 2016, along with the middle class tax cut announced in December 2015, will raise the level of real GDP by 0.5 per cent in the first year and by 1.0 per cent by the second year, compared to what would have been the case without these measures. This is expected to translate into 100,000 jobs created or maintained by 2017–18 (Table 2). The planning assumptions for nominal GDP and the fiscal balance presented in this budget do not explicitly account for this positive impact. However, most private sector forecasters anticipated that additional government measures to promote growth would be announced in this budget, and thus included the economic impact of assumed measures in their individual forecasts. As a result, the February private sector survey to some extent incorporates the economic impacts of the measures announced in this budget. This analysis was performed using the Department’s detailed macroeconomic model that estimates the contributions of government spending or tax policy to economic activity. Further details on this analysis, and the associated multipliers, can be found in Annex 2. Canada’s fiscal strength rests largely in its low debt burden, and protecting this source of strength is of paramount importance. Low debt ensures that future generations are not hampered by excessive interest payments. It also maintains market confidence in the soundness of Canada’s public finances and preserves Canada’s capacity to respond decisively to potential future economic crises. To maintain Canada’s low debt burden and its fiscal advantage compared to its G7 peers, the Government is committed to reducing the federal debt-to-GDP ratio to a lower level over a five-year period, ending in 2020–21. 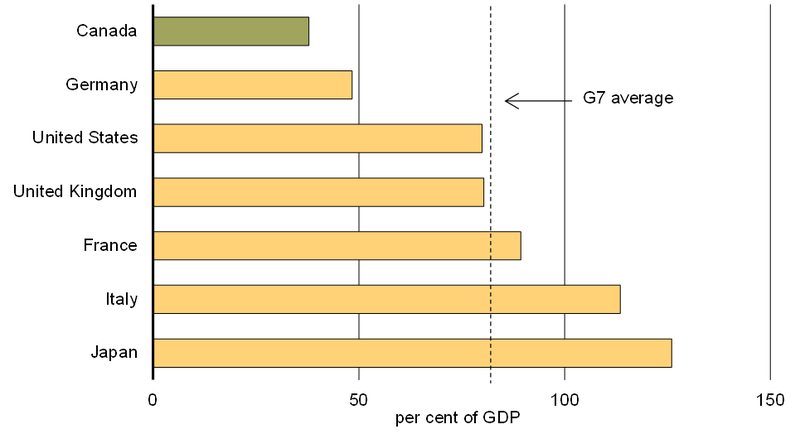 In doing so, the Government is ensuring that the hard-fought gains attained in the 1990s and 2000s—which saw the federal debt-to-GDP ratio fall by more than half from its peak of 66.8 per cent in 1995–96—are preserved (Chart 28). Sources: Department of Finance; Public Accounts of Canada; Statistics Canada. The Government remains committed to returning to balanced budgets, and will do so in a responsible, realistic and transparent way. While this budget presents a baseline fiscal forecast for planning purposes, transparent fiscal planning also means recognizing that a variety of economic scenarios will have different fiscal outcomes. It is the responsibility of the Government to clearly communicate to Canadians these forecasts and future intentions. It is important, for example, to consider the impact that alternative economic growth scenarios can have on fiscal projections, and to recognize that the accuracy of economic and fiscal projections is prone to more error when those projections extend further into the future. 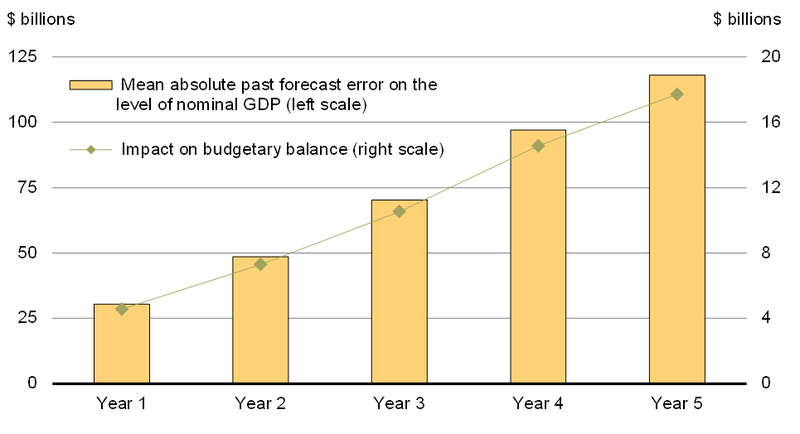 Economic forecast errors on the level of nominal GDP can have sizeable impacts on the budgetary balance (Chart 29). Notes: The mean absolute past forecast error is calculated using the forecast errors (in percentage difference in the level of nominal GDP) at each forecast horizon (one- to five-years ahead) in private sector surveys underlying each Budget and Update since Budget 1994. It is then applied to the projected level of nominal GDP in the February 2016 survey to get comparable $ billion figures. Sources: Department of Finance surveys of private sector economists; Department of Finance calculations. Further, small changes in economic growth assumptions can also have large impacts on the level of nominal GDP and thus on the budgetary balance over an extended projection horizon. For example, if the Government based current fiscal projections on the average of the upper four individual forecasts (or top four) for nominal GDP growth—which is equivalent to nominal GDP growth being 0.4 percentage points per year higher, on average, than in the full February survey—the budget would effectively be balanced by 2020–21, and the federal debt-to-GDP ratio would be well below its 2015–16 level (Charts 30 and 31). For comparison, the Budget 2016 fiscal track is based on the private sector forecast for nominal GDP adjusted downward by $40 billion per year for 2016 through 2020, which is equivalent to nominal GDP growth being 0.3 percentage points per year lower, on average, than in the February 2016 survey. 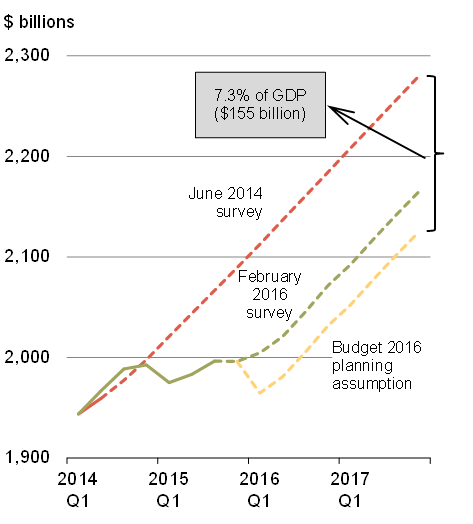 Note: The February 2016 survey scenario is based on the average private sector economists’ projection for nominal GDP, without any forecast adjustment. The top four scenario is based on the average of the four most optimistic projections for nominal GDP growth among the economists surveyed. Sources: Department of Finance survey of private sector economists; Department of Finance calculations. Going forward, the Government will continue to work with private sector economists to develop a baseline economic outlook for fiscal planning purposes. The Government will also develop alternative growth scenarios around the average private sector outlook, and these alternative economic scenarios—including their fiscal implications—will be communicated to Canadians as projections are updated. 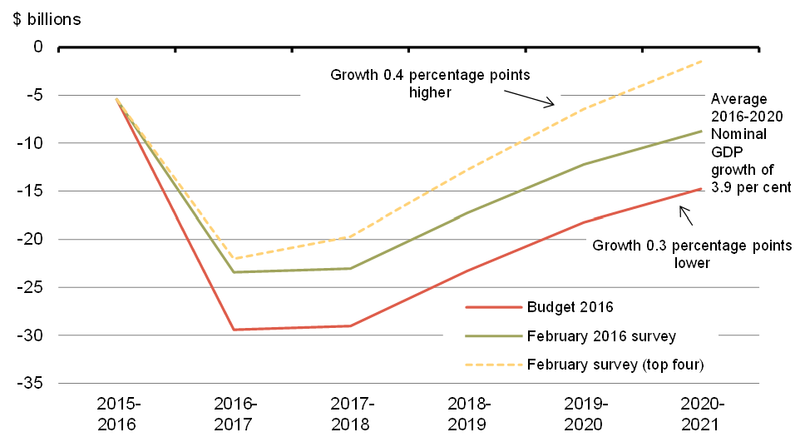 The Government will set a timeline for balancing the budget when growth is forecast to remain on a sustainably higher track. The balanced budget legislation enacted under the previous Government is inconsistent with the Government’s plan to return to balanced budgets responsibly, and in a manner that supports economic growth. 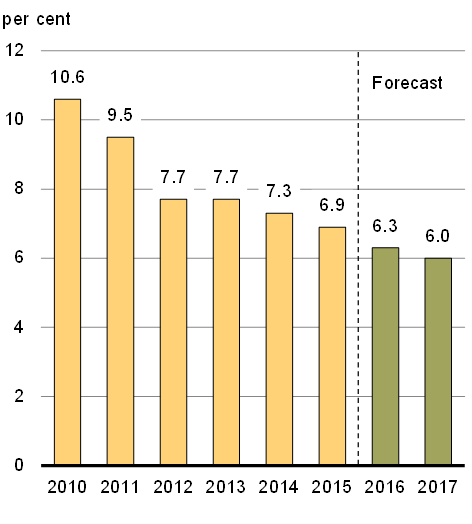 An immediate return to balance in 2016–17 would require fiscal consolidation in the order of 1 per cent of nominal GDP. As a result, the Government will propose legislative repeal of the Federal Balanced Budget Act. 1 Paid employment as measured in Statistics Canada’s Survey of Employment, Payroll and Hours (SEPH).